Glentoran manager Gary Smyth has criticised his team's 'criminal' defending in Monday's 2-1 home defeat by Glenavon. The Glens conceded twice in the final 10 minutes to throw away a one-goal lead which they had earned through Darren Murray's first-half penalty. It was a second loss in six league outings for the east Belfast side in a game Smyth felt they should have won. "That was a bit of a mugging," the Glens boss told BBC Sport NI. "I thought we were in complete control in the second half. We were under no real pressure at all, but we need to learn very quickly how to see games out. "To be honest I would have been disappointed with a draw so I am absolutely gutted - we conceded two terrible goals and must sort it out quickly. "For the first one there was a long throw-in, they won the flick-on and we didn't deal with the second ball. Gary Hamilton has tucked it in from five or six yards which is criminal. "The second goal comes from a header from inside their own half over the top of our defence and we were too flat with no cover." Glenavon player-manager Hamilton came off the bench to equalise against his former club at the Oval in the 81st minute, with Conor McCloskey hitting the winner two minutes from time. Smyth admitted he was unsure what to say to his players after the defeat, which leaves the Glens in ninth place in the table. "We have asked the question as to whether we lost our concentration," Smyth continued. "Once they got a goal and equalised, did we start to feel sorry for ourselves? I can't explain it so I'm going in there [to the dressing room] and I'm not really sure what to say." 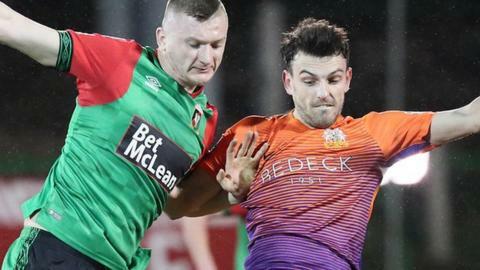 Glentoran, who are away to Coleraine in their next match on Saturday, are two points behind seventh-placed Dungannon Swifts in the race for the Europa League play-off spot, with the Swifts having played one game more.